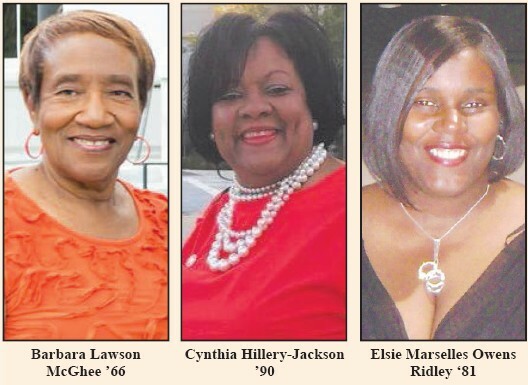 Savannah State University National Alumni Association presents the Queen Barbara l Lawson McGhee and her attendants Cynthia Hillery-Jackson and Elise Marselles Owens. The coronation will held on Thursday at 5p m. in the Gordon Library Miss SSUNAA 2017-18, Barbara Lawson McGhee ’66 is a Diamond Life member of the SSU Alumni Association, serves as financial secretary of the Savannah alumni chapter and is chair of the SSU community booster club. A native of Waycross, Ga., she graduated from Savannah State with a degree in English and earned a master’s degree in middle grade education from Savannah State – Armstrong State joint program. McGhee taught all ages in the Savannah-Chatham County Public School System before retiring in 1995. Since then, she has continued to work in education as an adjunct teacher, a GED instructor, and a tutor coordinator. SSUNAA National Attendant, Cynthia Hillery-Jackson ’90 is the newly-elected president of the South Dekalb Perimeter alumni chapter. She is also a member of Alpha Kappa Alpha Sorority, Inc. A native of Brunswick, Ga., Hillery-Jackson graduated with a degree in computer science technology from SSU and earned a master’s degree in education in instructional technology from Troy State University. She currently serves as the campus lead for instructional innovation and technology at Georgia State University. SSUNAA National Attendant, Elsie Marselles Owens Ridley ‘81 is a life member of SSUNAA and the Macon Metro alumni chapter. A resident of Warner Robins, Ga., Ridley is an accounting manager at Fort Valley State University. She earned her bachelor’s degree in business administration from Savannah State and her master’s degree in human resource management from the University of Phoenix. I am so proud of you. You are a great woman that wares a lot of hats, but you do the all with excellence. Love you your big sister sweetdi. Congratulations to my baby Sis always moving and making things happens .Never a dull moment when she’s around!!! Congratulations to my home girl Cynthia. We walked the halls of Brunswick High School together and sang in the BHS Show Choir together. I am so proud of you. Keep up the good work.